Sometimes, all you really want is steak and potatoes. They’re a tried and true combo, impossible to deny. If that’s what you’re craving, this recipe sure fits the bill. This classic dinner got a tasty upgrade, however, thanks to a few delicious twists that make it extra special. Seared sirloin is adorned with an herby, garlicky butter sauce that transforms everything it touches. 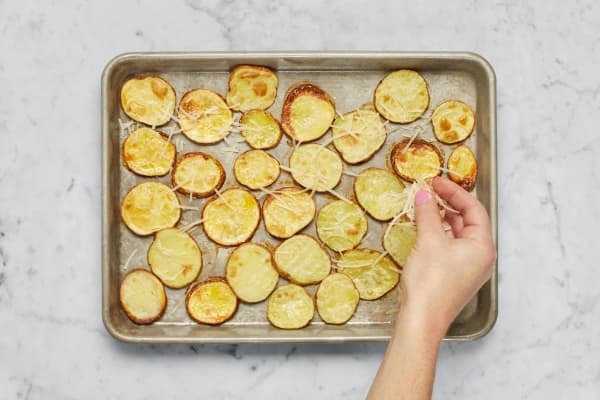 Crispy Parmesan-roasted potatoes are the perfect partner for swiping up any runoff sauce. 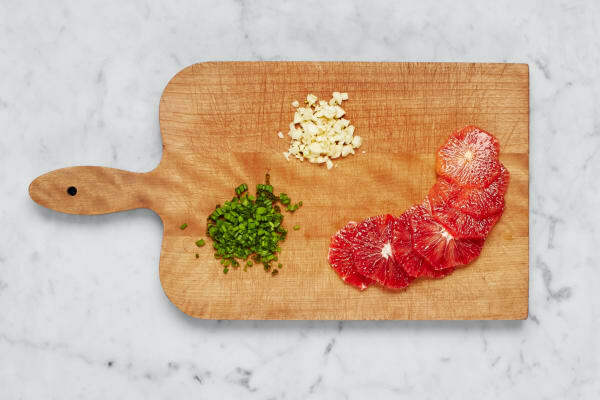 On the side, you’ll find a bright and refreshing green salad studded with juicy, sunset-hued blood oranges. Basically, this meal’s got everything you want and more. Adjust rack to top position and preheat oven to 450 degrees. Lightly oil a baking sheet. Wash and dry all produce. 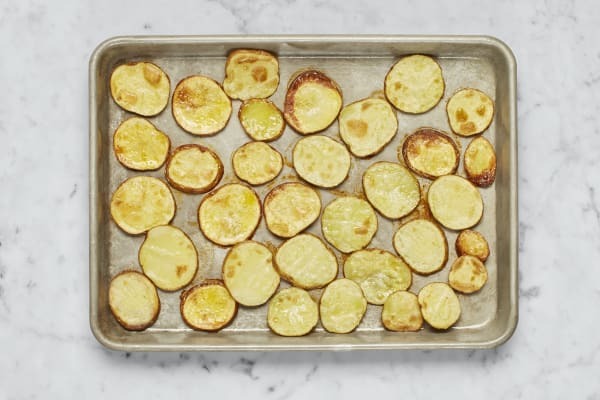 Slice potatoes crosswise into ¼-inch-thick rounds. Toss on prepared sheet with a large drizzle of oil, salt, and pepper. Bake on top rack until lightly browned and tender, about 20 minutes. Meanwhile, mince or grate garlic. Peel blood orange, then slice crosswise into rounds. Thinly slice chives. Pat steak dry with paper towels; season all over with salt and pepper. Heat a drizzle of oil in a medium pan over medium-high heat. Add steak and cook to desired doneness, 4-7 minutes per side. Turn off heat. Remove from pan and set aside to rest for 5 minutes. Wipe out pan. Once potatoes have roasted 20 minutes, evenly sprinkle with Parmesan. Return to oven until cheese is browned and melted, 5-10 minutes. 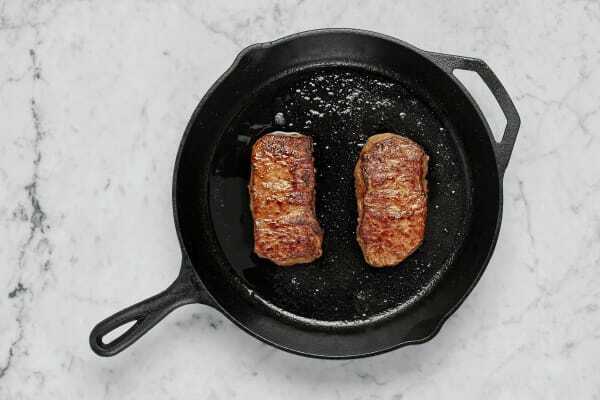 Melt 2 TBSP butter in pan used to cook steak over medium heat. Add garlic and cook until fragrant, about 30 seconds. 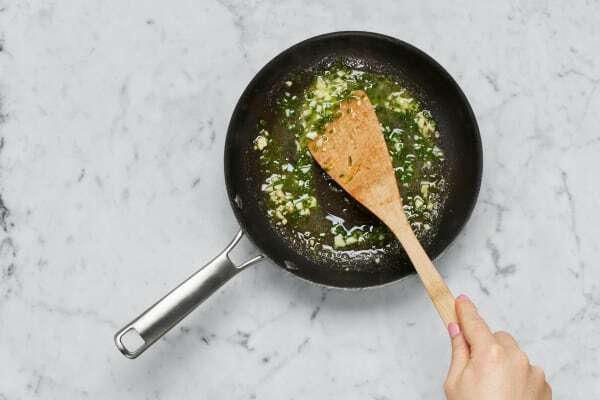 Reduce heat to low, then stir in chives until thoroughly combined. Turn off heat. Season generously with salt and pepper. 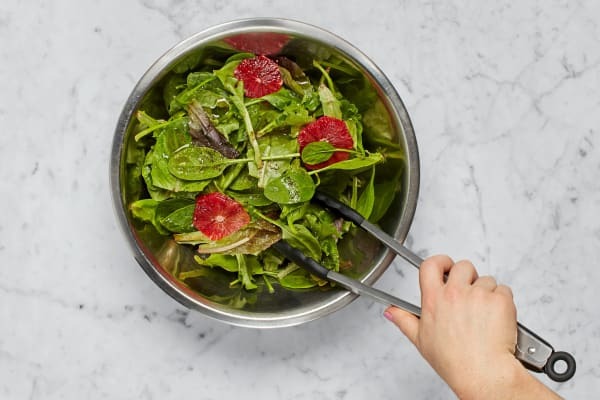 In a medium bowl, combine blood orange rounds, lettuce, a drizzle of olive oil, salt, and pepper. Slice steak against the grain. 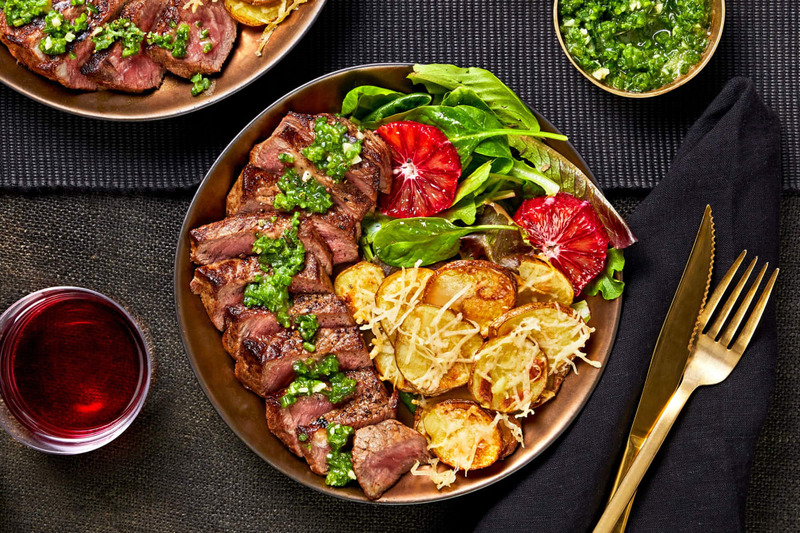 Divide salad, potatoes, and steak between plates. Top steak with sauce.